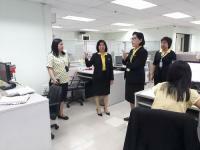 Miss Chunhachit Sungmai , Inspector General of Ministry of Finance, visited the government agencies and state enterprises under the Ministry of Finance, to receive a brief summary of the operation and discuss on problem and solution guidelines, at Bangkok Revenue Office 3 and Bangkok Revenue Office 4 , April 10 2019. Mr. Patchara Anuntasilpa, Director General of The Excise Department, announced the operating result of the Excise Department for six months, in which the Excise officials , employees and the press also joined the meeting , at Meeting Room 2 ,5th floor, the Excise Department, April 10 2019. Mr. Apisak Tantivorawong, Finance Minister, presided over the 4th MOF Top Executive Meeting 2019, at Vayupak 4, Ministry of Finance, April 9 2019. Mr. Prasong Poontaneat , Permanent Secretary of Ministry of Finance, together with top executives and officials of the Ministry of Finance, jointly worshiped the sacred of the Ministry of Finance and sprinkle water onto a Buddha image in an Occasion of Songkran Festival 2019 , at Vayupak Hall , 1st floor , the Ministry of Finance, April 9 2019. Mr. Apisak Tantivorawong, Minister of Finance,presided over the press conference Summary of the 23rd ASEAN Finance Ministers' Meeting: AFMM and other related meetings ,with attendees from various countries Attending a press conference at The Riverie by Katathani , Chiang Rai , April 5 2019. Mr. Apisak Tantivorawong, Finance Minister and Mr. Veerathai Santiprabhob, Governor of the Bank of Thailand , chaired of the 5th ASEAN Finance Ministers’ and Central Bank Governors’ Meeting: AFMGM, At this meeting, Mr. Boonchai Charassangsomboon, Inspector General of Ministry of Finance and Mr. Mathee Supapongse ,Deputy Governor of Monetary Stability both represented Thailand , at The Riverie by Katathani , Chiang Rai , April 5 2019. Mr. Apisak Tantivorawong, Finance Minister, presided over the 23rd ASEAN Finance Ministers’ Meeting: AFMM in which Mr. Wisudhi Srisuphan, Deputy Minister of Finance , who represents Thailand Representative also joined the meeting at The Riverie by Katathani , Chiang Rai , April 5 2019. 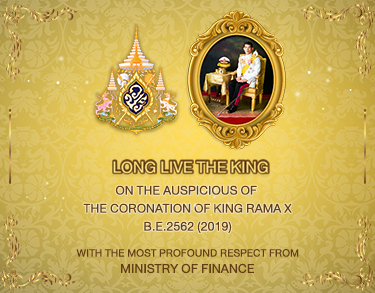 Mr. Prasong Poontaneat , Permanent Secretary of Ministry of Finance, together with the MOF’s top executives ,worshiped the sacred being of the Ministry of Finance on occasion of the 144th Anniversary of the Founding of Ministry of Finance at the statue of King Rama V, Ministry of Finance, April 1 2019. Mr. Prasong Poontaneat , Permanent Secretary of Ministry of Finance, received the money donation for charity and public benefit from Mr. Patchara Anuntasilpa , Director General of The Excise Department and representatives of government agencies, state enterprises and private sectors on occasion of the 144th Anniversary of the Founding of Ministry of Finance , in this occasion MOF also donated money for public charity to Rajavithi Hospital , at Vayupak 4, Ministry of Finance, April 1 2019. 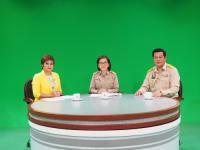 Mr. Yuttana Yimgarund, Deputy Permanent Secretary of Ministry of Finance,jointly had a VDO taping to Clear Cut TV Show, on the topic of Civil Servant's Day 2019 at NBT station , March 25 2019.in which the program will be broadcast on NBT TV on Tuesday , March 26 2019 at 9:30pm.